You are here: Home / Delivery / Which presenter remote do you recommend? What shape and size is it? There are small ones, large ones, and pencil-shaped ones. What features does yours have? Mine has forward, back, black out slide, and a laser. What type of battery does it use? I like that my remote uses 1 AAA battery, instead of a harder-to-find button battery. What do you like about it? I like that mine is very small, so that it fits easily in my hand and isn’t very visible to the audience. What don’t you like about it? My remote’s buttons make a clicking sound when I click them, which I find distracting. People near me in the audience can hear the sound. Become an Outstanding Presenter! New Course and Portal announced! Ellen, I have the same one you do for my own personal use. We use a couple of others in the classrooms here at Letourneau University. They provide mouse capabilities that the Targus does not. Also, they include wireless keyboard. That’s useful for a teaching situation (mathematics) where you are doing more than presenting. A couple of times I’ve run into a situation where my laptop had to be too far away and I was at the edge of the Targus’ receptivity. I bought a small, inexpensive Targus remote for my personaluse. I purchased it at Staples for somewhere around $30. My favorite remote for programs that I have to facillitate is an Infocus which basically has forward, backward, blank, and pointer. Very simple and virtually nothing for users to mess up. That is also why I like the small Targus one. One thing I really like about the Targus is that the remote receiver is small and stores in the presenter itself. Ellen, I use the Kensington remote. It fits easy into my palm, the USB fits inside of it for storage. Features are laser pointer at top, The right button advance the slide and the left button makes slides go back. The range is 60 feet and it works very well. Very quiet, no one notices that I have a controller because I do not need to point it anywhere at all for it to work. It uses two AAA batteries. The cost is around $30.00 on Amazon.com. I agree Cristián and John, the Kensington is also my favourite and the laser is unnecessary. That’s way I love the cheaper version with a PLAY button instead of the laser! The other day I had to work with the new Targus and it was not as comfortable as the Kensington, I haven’t use the Logitech though. Most recent purchase is a Logitech R400 (there is more more advanced R800 model). This is a comfortable shape to hold, has a retaining bay for the dongle, and works reliably and well with PowerPoint. It has a better wireless range than my aging Microsoft Presenter 3000. I have also tried a Gyration GP916T GyroTransport that was an interesting idea, but didnt work well for me. 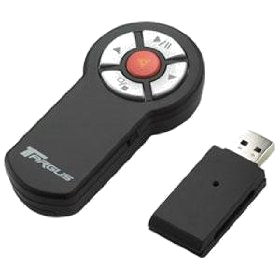 I’m interested in whether there is a reliable bluetooth presenter, so that I can stop worrying about losing the dongle; I tried a cheap Targus AMP11EU Bluetooth presenter but that wouldnt work reliably on my Windows laptop. We use Interlink (now SMK-Link) Electronics RemotePoint Global Presenters: http://www.smklink.com/index.php?id=Mzk5. I started buying these back in 2003, when they first came out, and must have purchased 25 or so of them over the years. These remotes perform well, are durable, feel great in the hand, and have a futuristic look. They have the typical forward, back, black out, and laser features, but also have eraser head navigation, a button on the bottom that’s the equivalent to a left-clik on a mouse, and a user-configurable button. Although they’re rated to work at a distance of 100 feet, I controlled one behind my back in a large convention room from at least 150 feet away. Last year I found someone selling them new in box for $30 on ebay and bought another 10 of them. I love my SMK-Link RemotePoint Onyx Presentation Remote. It fits perfectly in my hand and has simple (and silent) controls: forward, backward, black screen and laser (which I never use). I never have to look at it; all the buttons I need are directly under my thumb. I especially appreciate its 100-foot omnidirectional range, as I’ve been in situations before where my remote is very far away from the computer. I’ve never had a connection problem. It uses 2 AAA batteries, and the receiver stores inside the remote. It also has Auto RF technology that locates available frequencies to avoid interference from other receivers nearby (like when you’re presenting a breakout session and there are speakers in rooms on both sides of you!). Am I allowed to say none of them? The last point is the most significant. I don’t want to have to remember to pack a charger for my phone, one for my computer, half a dozen cables to connect to various projectors, power adapters for different countries and then a remote controller. What MUST I always carry? I therefore used to use an app on my phone but it only worked with Windows and since I now regularly switch between Windows and a Mac to both create & present, I can’t use that either. I like the idea of convergence. In fact I love it. We all carry around devices more powerful that the first computer I used at university [several years ago!] so asking it to be a presentation controller isn’t really asking/expecting much. But AFAIK, there is no single app available to control PowerPoint on a PC, on a MacBook and Keynote on a MacBook or iPad.